In a food processor, combine the first five ingredients; cover and process until smooth. Add the flour, baking powder, baking soda and salt; cover and pulse until mixture forms a soft dough. Transfer to a lightly floured surface; knead 4-5 times. Roll into a 15x12-in. rectangle. Brush butter to within 1/2 in. of edges. 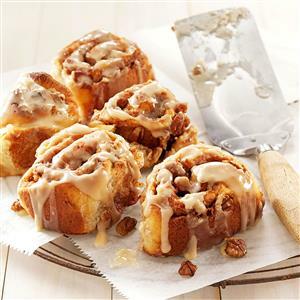 Combine the pecans, brown sugar and cinnamon; sprinkle over dough. Roll up jelly-roll style, starting with a long side; pinch seam to seal. Cut into 12 slices. Place cut side down in a greased 9-in. round baking pan. Bake at 400° for 20-25 minutes or until golden brown. Cool for 5 minutes before inverting onto a serving plate. Combine glaze ingredients; drizzle over rolls. Serve warm. Makes 1 dozen.